BAGHDAD, Iraq (CNN) -- U.S. Secretary of State Hillary Clinton on Saturday deplored the recent bombings in Iraq, but said the "terrible and tragic events" haven't stopped the nation from making strides in security. 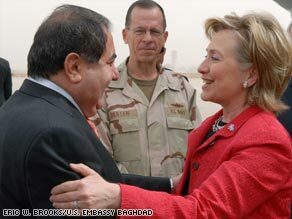 U.S. and Iraqi officials greet Secretary of State Hillary Clinton on her arrival Saturday in Baghdad. The bombings that left nearly 160 people dead and scores wounded since Thursday "are regrettable and horrible in terms of loss of life," Clinton said at a press conference during her unannounced, one-day visit to Baghdad. But Clinton said she and Gen. Raymond Odierno, the top U.S. commander in Iraq, share the same perspective about the high-profile bombings in Diyala province and Baghdad. "They do not reflect any diversion from the security progress that has been made," she said. "The reaction from the Iraqi people and the Iraqi leaders was firm and united in rejecting that violence and refusing to allow it to set Iraqi against Iraqi, which is obviously one of its intended goals." Iranian religious pilgrims were targeted in a couple of the incidents -- one at a Diyala restaurant and another at a Shiite shrine in Baghdad. The attacks have raised concerns in Iran, where the supreme leader, Ayatollah Ali Khamenei, on Saturday indicated that the United States was ultimately to blame for the attacks, Iranian news reports said. Time: Is Iraq unraveling again? "The main accused in this crime and other crimes are the U.S. security and military forces that have occupied an Islamic state under the pretext of a campaign against terrorism and have killed or wounded tens of thousands of people so far and have intensified insecurity there," the ayatollah said. Iran said it expects Iraq to confront such attacks and provide security for the pilgrims. Iran is predominantly Shiite Muslim and Iraq is majority Shiite, and religious faithful travel between the countries on pilgrimages. Clinton said she was unaware of Khamenei's remarks, but said, "It is disappointing for anyone to make such a claim since it is clearly traced to the al Qaeda remnants and other violent groups who wish to disrupt progress of Iraq." Iraq's Foreign Minister Hoshyar Zebari, also at the press conference, said he's unaware of Americans participating in such attacks. Zebari acknowledged there have been attackers in Iraq from a range of countries -- Saudi Arabia, Gulf states, and North African countries, such as Tunisia and Morocco -- reflecting remarks made Friday to a House panel by Gen. David Petraeus, leader of the U.S. Central Command. Clinton also met with other U.S. and Iraqi leaders and spoke with Iraqis at a town meeting. "We are committed to Iraq. We want to see a stable, sovereign, self-reliant Iraq," Clinton said at the town hall. Clinton said that America was an example of diverse groups living together. America has just elected Barack Obama, an African-American, as president -- "someone who is leading all Americans, not just one group or another group," she said. "I believe Iraq can be one of the strongest countries ... if there is a way to work together." Clinton praised Iraqi Prime Minister Nuri al-Maliki's "strong stand against armed insurgent elements, no matter who they were." The focus is on a nonsectarian security force that will not tolerate any attacks on Iraqis, she said. "And we will continue to support their efforts to integrate the military, and I think they've made a lot of strides," Clinton added. The Obama administration plans to pull out combat troops from Iraqi cities and towns by the end of June, and withdraw most troops from the country by the end of August 2010. But the recent spate of suicide bombings has raised questions about that timetable. Like Clinton, Zebari said he doesn't think the recent attacks will halt Iraq's progress. "I personally don't believe these deadly attacks will derail the government's determination to pursue plans to stabilize the country," Zebari said. Iraq has a timeline for the troop withdrawals and "we are doing our utmost and coordinating closely with the multinational forces to ensure there is no vacuum when that happens," he said. Clinton's visit coincides with the arrival in Iraq of the United States' new ambassador, Christopher Hill, who was confirmed to that post Tuesday in spite of strong opposition from conservative Republicans because of his previous diplomatic record on North Korea. This is Clinton's fourth visit to Iraq, the first as secretary of state. CNN's Jill Dougherty and Jomana Karadsheh contributed to this report.